It will soon be available around Quarry House. On page three there are buttons to link to sections relevant to you, or you can scroll through as normal. We’re all going on a (virtual) Sumer Holiday! We’re going where the sun shines brightly, we’re going where the sea is blue, we’ve seen it on the movies and we’re pretending that it’s true! Celebrate the summer with HASSRA Leeds by joining our Staycation. 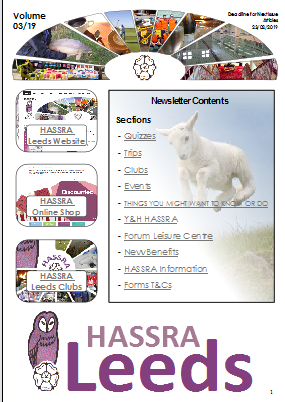 Sign up for your HASSRA Leeds passport and collect a stamp for every one of our qualifying activities between August and September. The person with the most stamps in their passport by the end of September will win a £100 Amazon egift voucher. 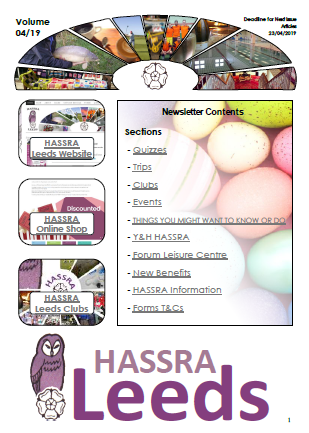 Look out for further qualifying activities in the itinerary in the August newsletter. 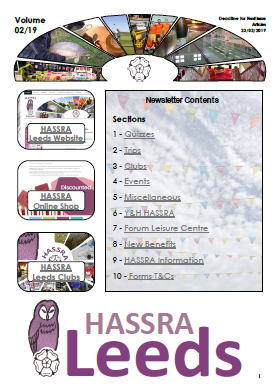 If you can’t use the links, email HASSRALeeds.craftclub@dwp.gsi.gov.uk with any queries. Hard copies will arrive at Quarry House soon. If you want to pick up some tips on how to take interesting pictures of urban life and learn how they can be manipulated and posted on Instagram, we have just the jaunt for you! Join Stephen Thorp on our first ever city safari at lunchtime on Wednesday 11 April. 11 April – Depart from West entrance at 12:15pm, returning just after 1:00pm. All fees will be donated in full to Action for Children, a charity working with disadvantaged children in the UK. We started our crafting fund-raising off with a successful lunchtime craft and chat, marking Time to Talk Day on 1 February. We set up our stall alongside colleagues from DH and DWP Wellbeing teams and had a paint-a–frog table. People stopped to fill their tea and biscuit boxes, paint a pebble frogs, make an origami lily pads, taking them away in their decorated goody bags in return for a donation to MIND. The frog theme came from a story from one of our members about something that helped her when she was in a really dark period. A friend had been ringing and texting, but she couldn’t cope with answering and switched off her phone. When the friend saw her a few days later, she said she’d been really worried and our member explained why. This sparked ideas from our creative members. We went with a frog theme and got people to paint pebbles to look like frogs – the idea being that you warned your colleagues that, if they saw the frog on your desk, it meant you were just about coping with work, but couldn’t deal with talking. The noise and giggles coming from the frog-painting table was really great. We talked to people about taking the time talk and the story behind the frogs. In return, people shared their own stories of how they coped. We thought we might have beaten last year’s donated amount because we had a few notes. When we counted up at the end, we’d raised £94.46! We were giddy enough about that, but one of the ladies on the Wellbeing stand topped it up to £100 for us. We’ve since received another £4 – £104 in total. So if you’re in Quarry House and see a green frog-pebble on a desk, you’ll know why! Elizabeth Letaief, Jan Legge and Hazel Mullinger set up our first off-site Crochet and Chat session at Meanwood Valley Urban Farm on Saturday 3 February. Jan received lots of ‘oohs’ and ‘aahs’ about her fabulous crocheted blanket and gave an impromptu lesson on making chains and double crochet. Elizabeth started making little crocheted hearts for the RHS Malvern Spring Festival’s Work of Heart Garden appeal – knitted or crocheted hearts to join among 10,000 ‘Works of Heart’ created by local knitters, community groups and celebrities. Visitors to the Festival will be invited to place them on trees around the ‘Work of Heart’ garden in return for a donation to Sue Ryder Leckhampton Court Hospice, making this a living and growing display over the course of the festival. Visit http://files8.design-editor.com/94/9404018/UploadedFiles/C0E280FC-054E-76DA-1594-4E43594FCFCE.docx to download the knitting pattern or http://files8.design-editor.com/94/9404018/UploadedFiles/4F900984-1255-F95E-6C93-D8C1A2BB9084.docx to download the crochet pattern to create your own ‘Work of Heart’ for the display. Our next Crochet and Chat is on 3 March at Meanwood Valley Urban Farm Barn Café from 2:30pm. Following the success of the origami lily pads, Trish Sames, one of our new members, showed us how to make origami hearts in time for Valentine’s Day. By the end of the session, we’d all managed something that looked like a heart and took away the instructions and more paper to have another go. Our efforts making Twiddlemuffs continues. These intriguingly named items are to help dementia patients. Each knitted twiddlemuff has items such as buttons and ribbons sewn on, so any help attaching these would be appreciated. If you’d like to help, please email Janet.Reid@dwp.gsi.gov.uk. Here’s a link to a pattern and more information about what they are and how they help patients: http://www.repod.org.uk/downloads/Twiddlemuffs_Instructions_24-01-15.pdf. If you’d like to donate any items you’ve made, Anne can include items in her parcels. Anne’ is also happy to take 12” knitted/crocheted squares to join into bigger blankets. This initiative will run until mid-May. Please contact Anne.P.Brown@dwp.gsi.gov.uk for more information. We still have places on some of our events – if you’d like to attend, please email HassraLeeds.CraftClub@dwp.gsi.gov.uk and we’ll get back to you.